International Night: New Zealand – ISWI e.V. 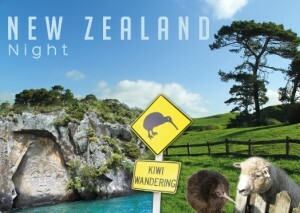 This time we take you on a trip to the country of Kiwis (referring to the fruit and the bird as well as the people from New Zealand). Like always, there will be a selection of delicious typical food and a presentation, that will allow you a glance behind the scenes (aka stereotypes). Furthermore, there will be a ‘Haka’ workshop (The ‘Haka’ is a traditional dance of the Māori people, the native inhabitants of New Zealand). Of course, you could also talk to ‘real’ Kiwis and get a personal insight, because at our university there are also students from New Zealand. See you on Monday!